How can I get involved with EthHub? Head on over to the EthHub's Github repo. See Internationalization for more details on the plan to translate EthHub. Learn to make pull requests from the section above. To translate a page, simply navigate to the branch for your desired language and make a pull request on the page you translate. 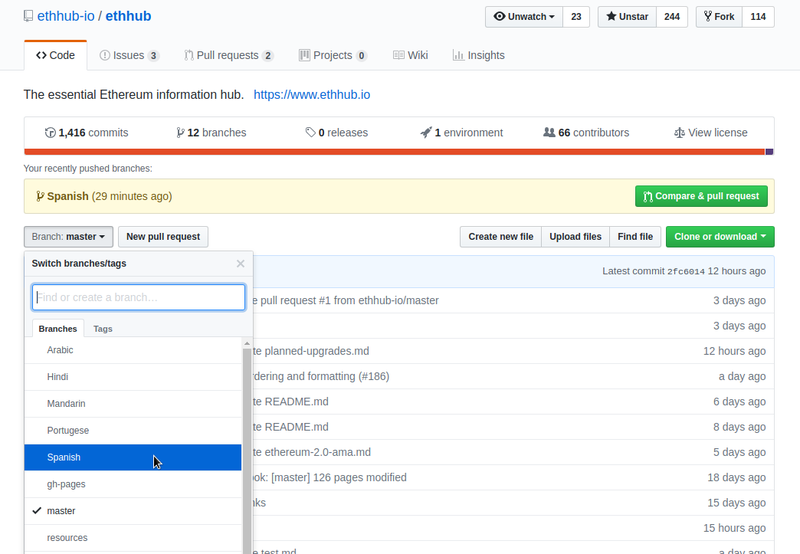 Note that all changes and pull requests should be submitted to their target language's designated EthHub repo branch. If you don't have the time, talent, or energy to contribute to EthHub directly, that doesn't mean you can't play a part. EthHub plans to continue to provide educational content to the Ethereum community. However in order to maintain sustainable current and spur future growth, we're seeking community donations as well as implementing ideas for other revenue-generating activities that will allow us to inject the capital straight back into growing EthHub. Additionally, at the start of every month, we plan to publish a detailed transparency report breaking down the revenues we’ve generated, what the funds were used for, current balances, among other things. If you’d like to support the continued growth of EthHub, please consider supporting us by sending a one-time donation to 0xa19fcdad77c1f0fd184689aca88babcf68010347 or a recurring donation via our Gitcoin grant.